Boo to You! 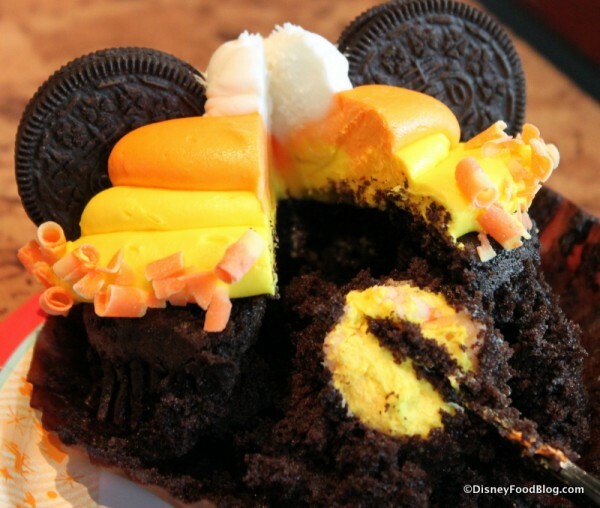 It’s Halloween Week, and the Disney seasonal treats just keep coming! 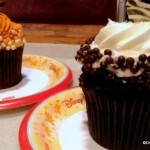 Today, we’re showing you a fun Fall find from The Mara at Disney’s Animal Kingdom Lodge. I love me some candy corn, but when you combine candy corn and Cupcakes? Even better! 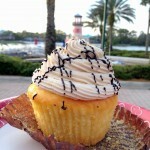 So, Disney World has some hidden gems that keep churning out awesome eats that you’d never expect. 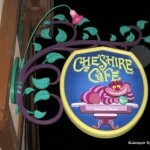 Places like Sleepy Hollow and Friar’s Nook in the Magic Kingdom, and Landscape of Flavors at Art of Animation Resort tend to be little hot-beds of creativity when it comes to snacks and must-eat treats. The Mara at Disney’s Animal Kingdom Lodge also fits into this category, featuring some seriously great baked goods on a regular basis (like the Chocolate Raspberry Mickey Tart). And so I give you the Candy Corn Cupcake — with Oreo Mickey Ears, even!! Mounded high with thick Buttercream Frosting in Candy Corn’s traditional tri-color pattern, the cupcake is trimmed out with orange-tinted White Chocolate Curls for even more visual impact. This is all piled on top of dark Chocolate Cake. But when you cut into the cupcake, you’ll find a little surprise hidden inside. Now, to be honest, I’m not completely sure what this is. There is definitely chopped up Candy Corn in there, but the consistency is more firm than frosting. Maybe a White Chocolate Ganache? Yeah. We’ll go with that. 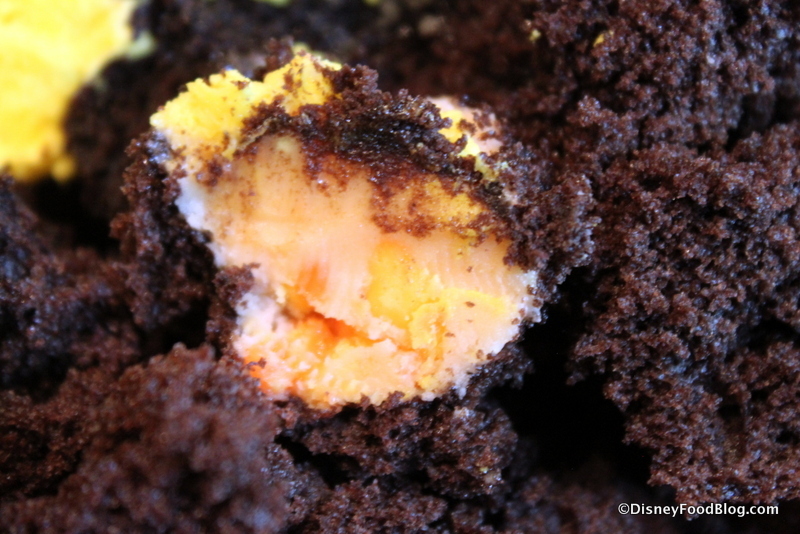 It was kind of like a candy corn Halloween Truffle tucked inside. The flavors here are sweet, sweet, and more sweet. So if you’re looking for a Sugar Big Bang, you’ve found the cupcake of your dreams. 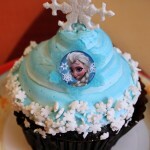 And don’t forget to check out even more awesome Disney cupcakes in our Disney Cupcake Gallery! 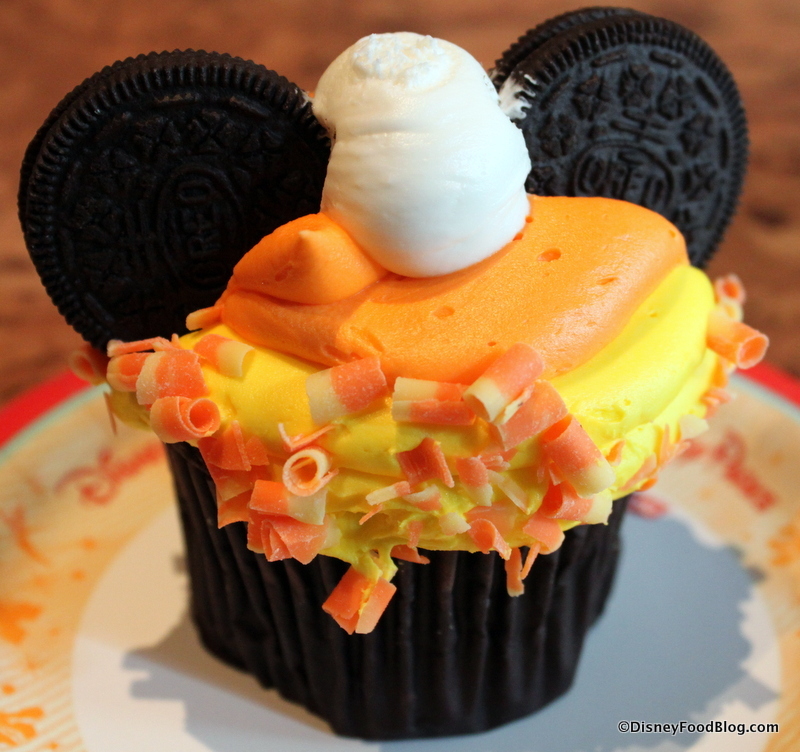 Will you be seeking out the Candy Corn Cupcake at The Mara before it disappears? Let us know what you think in the comments! I’m assuming this won’t last into November. 🙁 That amount of frosting would make me very happy. Oh well – I’m sure they’ll replace it with something equally awesome! Personally, I wouldn’t go near this thing. I’m one of those people who cannot stand candy corn, and I also am not a big frosting fan. I much prefer lots of cake over lots of frosting. But that’s just me. I sure wouldn’t mind trying one! I may not eat the entire treat, but I’d be happy to get to know one. I would love to try one as well. Can’t wait until we get to Disney.